FOX News ‘terror expert’ sentenced to prison… | Get Off My Lawn!! A man who falsely claimed for decades to be a CIA agent and worked as the FOX News “Terror Expert” has now been sentenced to 33 months in prison, according to prosecutors, as cited by Reuters. According to a U.S. District Attorney’s Office statement, Wayne Shelby Simmons of Annapolis, Maryland, was sentenced in a U.S. District Court in Alexandria, Virginia. U.S. District Judge T. S. Ellis III also ordered Simmons to serve three years of supervised release, pay restitution, and to forfeit two firearms and $176,000 in criminal proceeds. Simmons had previously listed himself as a “CIA operative,” and had appeared as a guest contributor since April 2003 under that assumed role. Reuters noted a grand jury indicted the former FOX News contributor in October for fraudulently posing as an “Outside Paramilitary Special Operations Officer” for the Central Intelligence Agency for decades — from 1973 until 2000. According to the statement, Simmons’ jobs during that period had nothing at all to do with the CIA. This FOX News expert’s previous jobs included nightclub doorman, bookie, manager of a rent-by-the-hour hot tub business, mortgage broker and defensive back for the National Football League’s New Orleans Saints. Simmons didn’t just fool the fools at FOX News either. The US government sought out this former doorman’s expertise as well. According to the statement, Simmons defrauded the government in 2008 when he got work as a team leader in an Army program, and again in 2010 when he was deployed to Afghanistan as an intelligence adviser. He said he made similar false statements in a 2009 bid to get work with the State Department’s Worldwide Protective Service, according to Reuters. 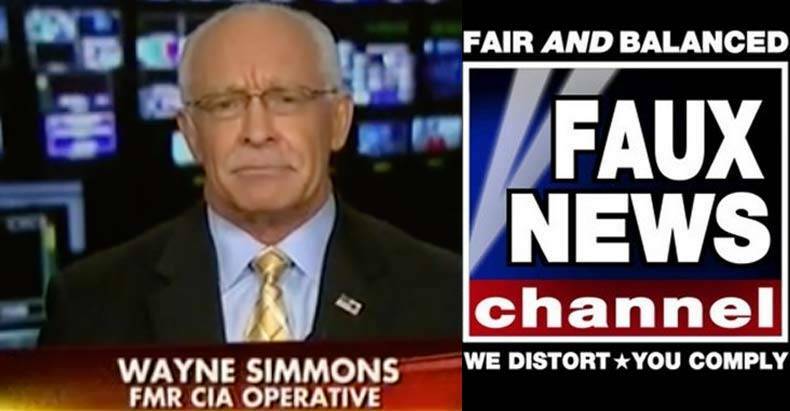 Not only did Simmons dupe the government and FOX into believing he was an expert, he also managed to hide the fact that he was a two-time convicted felon, claiming the convictions were part of his CIA cover. While the idea of FOX News and the government allowing him to make fools out of Bill O’Reilly, Sean Hannity, Andrew Napolitano, Neil Cavuto, everyone at Fox & Friends, and the CIA for over a decade is laughable, the utter hate, lies, and warmongering that spewed from this man’s mouth was anything but humorous. During an interview with Neil Cavuto last year, Simmons falsely asserted that “at least 19 paramilitary Muslim training facilities” were currently operating in the U.S. to conduct terrorist activities. Simmons credited another FOX News guest contributor, Ryan Mauro, as the source of his erroneous information. As the national security analyst at the Clarion Project, Mauro’s brand of Islamophobia falls right in line with Simmons’. After former CIA case officer, John Kiriakou exposed the government’s torture program in 2007, Simmons justified the use of torture on a radio show hosted by Judge Andrew Napolitano and Brian Kilmeade. After rationalizing the destruction of the 92 videotapes that recorded enhanced interrogations, Simmons refused to admit that waterboarding is torture. During an interview with Fox & Friends, Simmons falsely accused then-Senator John Kerry of “publicly calling our soldiers/sailors/marines murderers and terrorists.” Although FOX News anchor Greg Kelly repeatedly attempted to correct Simmons and even read Kerry’s exact quote to Simmons, the phony CIA agent refused to take back his lie. Previously convicted for a crime of violence and firearms offenses, Simmons was able to acquire a security clearance because of the incompetence behind FOX News and the federal government. Responsible for spreading disinformation and his Islamophobic agenda for over a dozen years, Simmons was finally sentenced on Friday. However, his sentence is certainly lax considering the maximum he was facing — and the damage he’s done. One thing is certain, however, and that is the fact that FOX News and the federal government will most certainly not attempt to reverse any of said damage — as it helped them to accomplish their divisive and hateful agenda.